Atara, West Bank: Palestinian businessman Bashar Masri stood on a West Bank hilltop watching engineers, work crews and bulldozers hard at work, turning his dream of building Rawabi, the first planned, modern Palestinian city, into reality. Last week, crews began excavations to build the first phase of the $500 million Rawabi city, designed with high-rise, modern residential apartment blocks, green parks, a high-tech commercial district and sophisticated road networks, marked for young Palestinian professionals looking for affordable homes and technology jobs. "For the first time we are launching a project to build Palestinian homes and to emphasise our right to develop our land. Definitely this plan fits in the nation building. Nation building is not just political, it's also giving a better quality of life, picking up the economy, planning and developing. 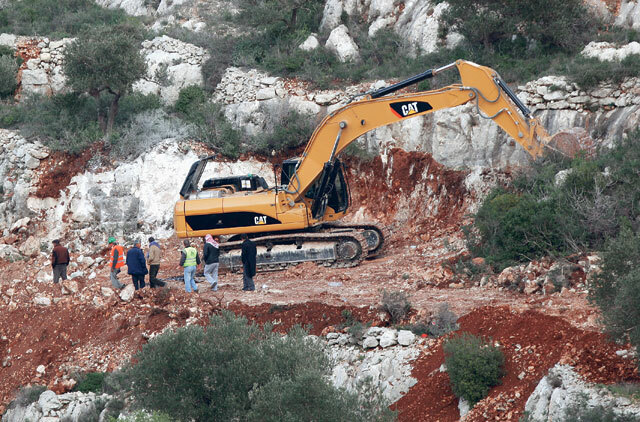 Rawabi brings in all of that," Masri said as he followed bulldozers through a muddy path, instructing workers to avoid uprooting olive trees which he plans to preserve and replant in the city's green areas. Building on Rawabi, the Arabic word for hills, about 20km north of occupied Jerusalem, began after Masri's Bayti Real Estate Investment Company and Qatari Diar, its main partner financing the project, received the Palestinian National Authority's [PNA] approval for its masterplan, developed by local experts along with architects and engineers from international firm AECOM. Palestinian Minister of National Economy Hassan Abu Libdeh said his government backed the Rawabi project that serves as a model for Palestinian-Arab partnerships in projects that help improve the economy and create badly needed jobs for Palestinians. The new city will provide more than 5,000 affordable homes with nine styles to choose from, spread across 23 neighbourhoods. Initially, it will be home to 25,000 residents and will ultimately have a population of 40,000 in subsequent construction phases. Planners say Rawabi, to be built on 6.3 million square metres of land, will have its own municipality and is expected to create thousands of jobs. It will include a fully developed infrastructure, business district and commercial centre, private and public schools, mosques, church, public parks, hotel and convention centre, cinema and library, as well as health centres. Large Palestinian cities such as Ramallah have become overcrowded and have severe housing shortages. With Ramallah as the temporary seat of the Palestinian government, most businesses have moved from the various West Bank towns to Ramallah and its neighbouring towns. 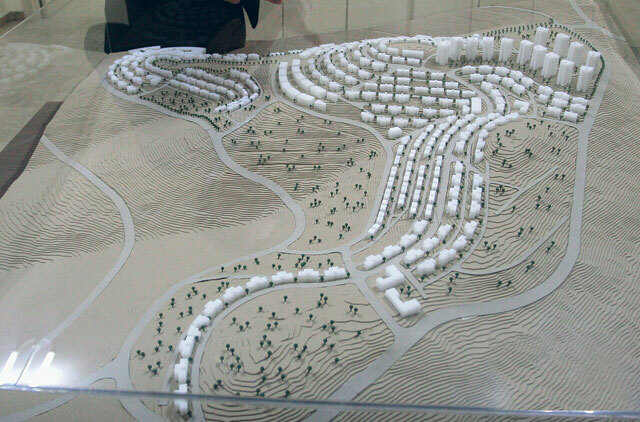 Building a new city such as Rawabi, only 9km from Ramallah, at affordable prices, would help solve the housing problem, create jobs and give residents access to larger nearby cities. On the building site, engineer Tarek Nazzal, wearing his green Rawabi hardhat, pointed to a map showing a network of roads and infrastructure that would be built in the city. He said he did not hesitate to leave his job in Dubai to work on the Rawabi project when he was offered the job in Ramallah three months ago. "My friends warned me against moving to work on a project that might not materialise. This unprecedented project is becoming a reality, and I'm glad I followed my instincts. I'm happy for my people and hope this project will create jobs for other people like me who will leave their jobs overseas and return to Palestine to build it," Nazzal said. "I remember when I was in Dubai building new cities and districts, such as Palm Jumeirah, where we started from the desert to build new development projects, green areas, villas, buildings. It was a satisfying experience to build from scratch there, but the feeling is different when you build from scratch in your own country, for your people," he said. Masri was successful in real estate development in the Arab world. "I decided if we can be successful in real estate development in the Arab world, then we should be able to succeed in Palestine where the housing shortage is huge," Masri said. Projects such as Rawabi were facilitated by the Palestinian government's success since 2007 in changing the situation in the West Bank by putting an end to armed chaos and imposing the rule of law. Although the peace process between Israel and the Palestinians is stalled, the Palestinians in the West Bank have seen economic improvements. However, Palestinians insist that without a political solution that puts an end to Israel's occupation which began in 1967, economic progress can be reversed. Israel's recent removal of some West Bank army roadblocks and the easing of travel restrictions have helped the recovery of the Palestinian economy, but Palestinians complain that the dismantling of some permanent checkpoints has been replaced in many instances by mobile army roadblocks and daily incursions into Palestinian cities were undermining Prime Minister Salam Fayyad's two-year plan to build the infrastructure of the future Palestinian state. Abu Libdeh said Israel continues to block big government and private projects in Palestinian areas under its jurisdiction designated by the Oslo deals as Area C and which make up some 61 per cent of the West Bank. Israel should have transferred control over these areas 18 months after the 1995 deal on dividing the West Bank was signed, but has kept the areas where major Jewish colonies are built for what it calls security requirements. Area A falls under Palestinian civil and security jurisdiction and makes up some 17 per cent of the West Bank. Area B, some 23 per cent of the West Bank, falls under Palestinian civil jurisdiction and Israeli security control. Masri's vision was initially to build two projects, one in the Gaza Strip and the other in the West Bank. The Gaza project was put on hold as a result of the closure and Israel's restrictions on the entry of goods and construction material into Gaza. Masri decided to invest in real estate in the West Bank in mid-2007, but it did not come without risks or challenges. "Problems or challenges we had were buying the land. We had to buy the land from more than 3,000 individuals living all over the world … The more important challenge is the access road that connects Rawabi to the larger Ramallah area," Masri said. "This is an essential road because you can't have a city that has no connection to the rest of the West Bank, and that road goes through Area C under Israeli jurisdiction. We are waiting for an Israeli response to our request to transfer the road from Israeli to Palestinian control," Masri said. Travellers to Rawabi, near Atara village, now pass through several Palestinian villages. The access road is essential for the future growth of the city. Masri said there was still no agreement on the provision of water which would have to come from the Israeli water company since most of the water resources are controlled by Israel which gives quotas to the PNA, "and we are seeking to increase that quota, especially for Rawabi." "We are sure, however, we can overcome these challenges," he noted. Masri said the Palestinians did not have planned cities in the past because Israeli occupation authorities prevented them from planning new cities or even expand existing cities. It was only when the PNA was created that the Palestinians no longer needed building permits in only about 40 per cent of the West Bank. The only planned communities the Palestinians have known in the West Bank were the Jewish colonies built on hilltops of occupied West Bank land. "The fact that Rawabi is planned does not equate it with [colonies]," Masri said. That is why the Rawabi planners designed the city to avoid similarities with [colony] houses that have red roofs and built in organised rows. "We all hate [colonies]. They represent the evilness of the occupation. Palestinians must restrain [colony] expansion by building more themselves," he said.